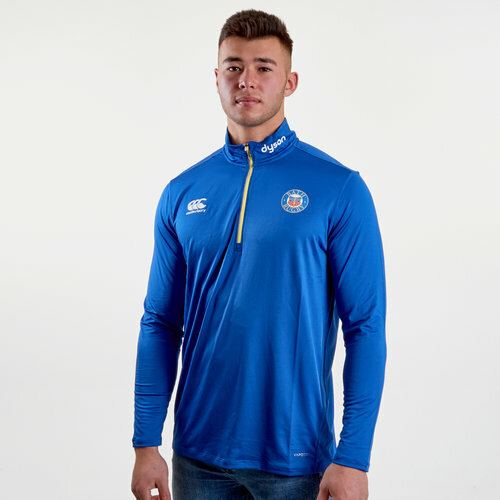 Keep it fresh and look your best whether out and about or at the Recreation Ground in the Bath 18/19 Poly First Layer Training Top Canterbury. 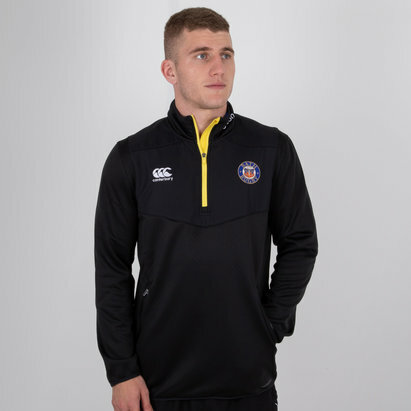 Bath FC of the Gallagher Premiership have a fresh new 18/19 training attire which looks like a winner feature Bath's classic three colours; black, blue and white. Designed for movement, comfort and breathability, the Bath VapoDri Poly First Layer Top features VapoDri technology to keep you cool and dry. The forward facing side seams allow a greater ease of movement, and forward facing shoulder seams reduce irritation when carrying a backpack; while the drop back hem eliminates distraction from garment rise. This training top is blue with a yellow zip. The club badge and CCC logo are embroidered on the left and right as worn, respectively. The club's sponsor - Dyson - is embroidered on the left collar. Look your best in this Bath Poly First Layer Training Top.